Dundee Africa Research Network (DARN): DARN Report: Is South Africa's Future Expropriated? DARN Report: Is South Africa's Future Expropriated? 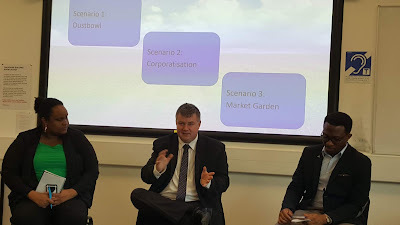 The following is a report of the talk given by Mr. Corrigan for DARN at the University of Dundee. Swiftly building on the resounding success of the last talk in March 2018 on Cranofacial Research in Africa, and in line with the core ideals of DARN, Terence Corrigan delivered a pulsating talk on the current developments in land distribution issues in South Africa, on Thursday 12thJuly 2018. Mr Corrigan is a Project Manager in the South African Institute of Race Relations. He is also a Research Fellow at the South African Institute of International Affairs. In December 2017, the South African Parliament instituted a new policy - Expropriation Without Compensation (EWC) - to govern the distribution of land in South Africa. “Is South Africa’s Future Expropriated” sought to unpack the key issues and highlight the economic and socio-political implications of this policy in South Africa. The speaker highlighted the progress of land reform in South Africa as slow, disappointing and characterised by unsuitable project designs, budgetary lethargy and post-settlement support. However, the policy of EWC, which is couched in the language of land reform, is a contextualized and realistic land reform policy grounded on rigorous research taking cognisance of the economic realities in South Africa. It was particularly interesting that no useful details have been offered by the policy makers on the potential of EWC to expedite land reforms. This is especially so considering the uncertainty surrounding EWC to create an atmosphere of insecurity for local and foreign businesses at a time when South Africa’s unemployment rate recently reached record highs. With these developments highlighted by talk, the future of land reform inSouth Africa is definitely one to look forward to. 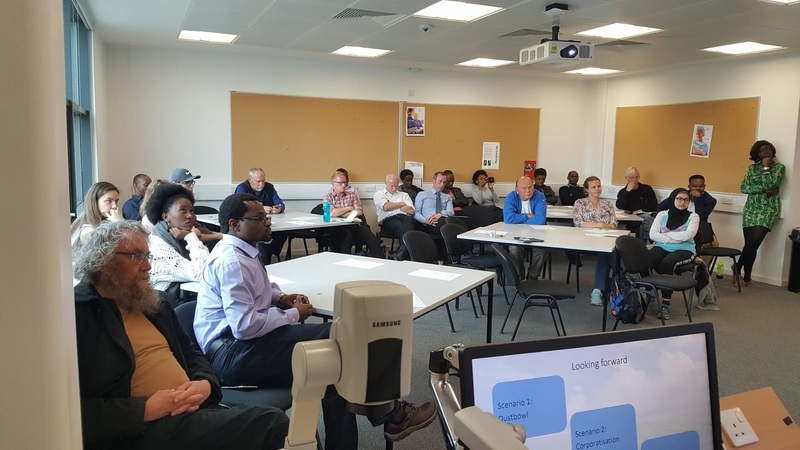 The issues addressed in the talk, coupled with the positive feedback from attendees from varied academic and professional backgrounds, culminated in a rich discussion that will be remembered for a long time to come. Networking opportunities were impressively exploited, as it is one of the foundational goals of DARN. It is our hope that such opportunities for networking will continue to be keyed into. We heartily appreciate Terence Corrigan for giving this timely talk, and we hope this is one of many to come.